Volunteers gather ahead of 2016's Day of Civic Service, the first time the Law School cancelled classes on Election Day. 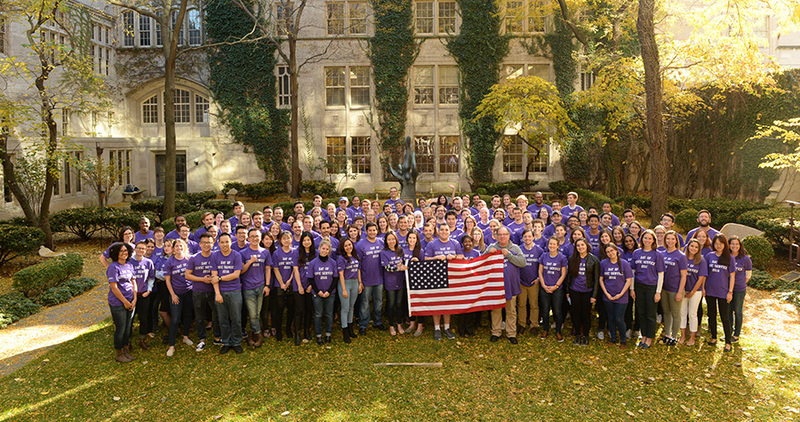 The student-led event, initiated by members of Northwestern Law's chapters of the American Constitution Society and the Federalist Society, first took place on Election Day in 2016, when more than 200 students and faculty members participated as election judges, poll watchers, and other volunteers. This year, student leaders have partnered with three local organizations: Election Protection, Voting Access Chicago, and the Chicago Board of Elections. Volunteers with Election Protection, the nation’s largest nonpartisan voter hotline which is run locally by Chicago Lawyers’ Committee for Civil Rights, will serve as poll-watchers or legal hotline volunteers. Those working with Voting Access Chicago, a nonpartisan venture between Equip for Equality, the Chicago Board of Election Commissioners, and the Department of Justice, will survey polling places to ensure they comply with the ADA. Participants can also choose to serve as election judges and coordinators with the Chicago Board of Elections. Interested students and faculty members can learn more about the volunteer opportunities and register online.